It’s almost the end of February and the year is in full swing. It is time to make sure you have taken a look at the upcoming year, gotten a clear assessment of where you stand on the IT maturity curve, and made a plan to move up the curve by the time next year rolls around. Are you on track to shift from a technology-focused order receiving IT culture to one that is a consultative business partner of choice? Here are 5 ways to advance your IT organisation this year. The beginning of any progression is first to get a very clear understanding of your starting point. Look at your teams and be very honest and candid about at what level they are operating. 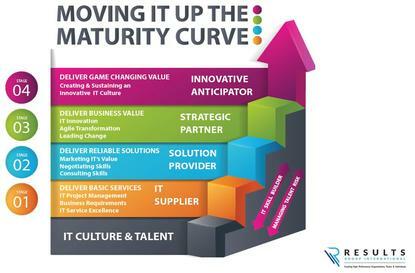 One of the most common errors that slows progression is assessing the IT organisation to be at a higher stage of the maturity curve than it actually is. One of the primary reasons this occurs is that you can mistake having people or teams at higher levels with having the overall critical mass of the team at that level. If you attempt to operate at a higher level than you are, you don’t have the capabilities or relationships with the rest of the organisation to be successful at that level. You then lose time as you have to move backwards before you can begin the forward progression again. Once you have a clear indication of where you are starting the IT transformation journey this year, the next step is to create a realistic target of where you would like to be by the end of the year. There are many factors that will impact the rate of progression. They include the receptivity and engagement levels of your team, the past relationship between IT and the rest of the organisation, what the perception of IT is from the rest of the business as well as the size of your team. A culture shift can happen much more quickly in a team of 200 than in a team of 2,000 as the critical mass tipping point can be reached faster. Now that you know where you are and where you want to go, identify the skills gaps that are holding you back. In a recent survey, Accenture stated that 51 per cent of IT professionals do not have the skills they need to be successful today and only 21 per cent are receiving training to address these gaps. In order to progress, it is critical to identify the skills gaps in your organisation so they can be addressed. When looking at moving up the maturity curve, the two places to look at first are the skills required at the level you are operating on and the skills required on the level you are aspiring to progress to. You’ll want to see if the skills required at the level you are operating in are strong enough to serve as the platform to move to the next level or it will be necessary to reinforce them. If they are, you may identify that IT needs to be more consultative to start operating at level 2. Assessment tools such as IT Skill Builder can be helpful with this analysis. You now need to create the plan that addresses the development of these skills over the course of the year. This includes identifying who on your team needs to development which skills, how it will be done (workshops, consulting, coaching, mentoring, etc.) and when it will happen. It also includes deciding who is going to do it and who is accountable for ensuring it will take place. You all know how important culture and talent development is for the success of our team and the progression of your IT organisation. You are all also inundated with day to day operations, tasks and fires that need your attention. It is very easy to lose sight of the big picture, strategy and plan. Allocate a specific amount of your schedule as context time to keep your IT transformation on track.